Having dry eyes is becoming a common problem, especially in cities with high levels of air pollution. A recent news reports cite urban areas such as New York, Chicago, Miami and Los Angeles as places where people are more likely to experience dry eye syndrome than less urban places with minimal air pollution. In this article, you will know more about dry eyes. Your eyes have a natural way of keeping themselves moist, which depends on the production of tears to maintain lubrication, comfort, and vision. Tears consist of water, oils, mucus, antibodies and other proteins, which protect the eyes from dryness and infection. These are secreted by the tear glands around the eyes. An imbalance in tear production may lead to dry eyes. Problems with tear quality involve any of the three layers of tear film, which can cause symptoms of dry eyes. Oil. Oil forms the outer layer of the film of tears, which smoothen the tear and slow the evaporation of the water layer. If the oil glands do not produce enough oil, the water layer evaporates quickly and causes drying of the eyes. This is common in people with blepharitis, rosacea and certain skin disorders. Water. Water forms the middle layer of tears with a bit of salt. It cleanses the eyes by washing away particles in the eye. If you produce inadequate water in your tears, you may form a stringy eye discharge. Mucus. Mucus forms the inner layer of tears, which helps spread the tears evenly over the eyes. If you do not have enough mucus in your tears, dry spots form on the surface (cornea) of the eye. 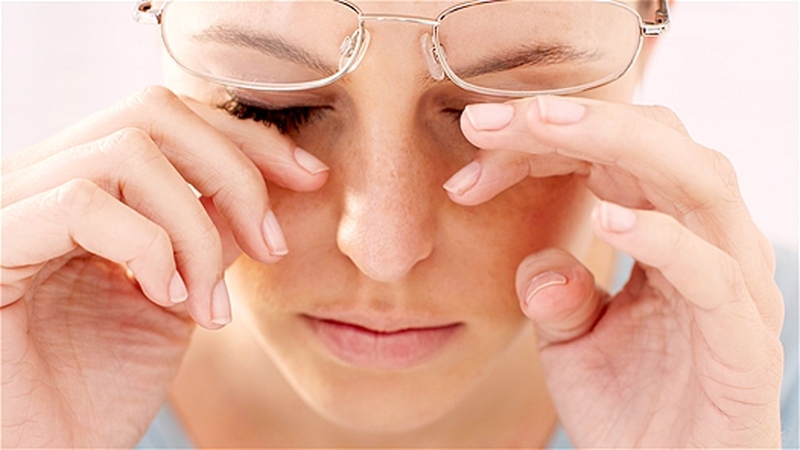 Problems in blinking the eyelids can prevent the continuous spread of a film of tears on the eye surface. Eyelid problems such as entropion (in-turning of the lids) or ectropion (out-turning of the lids) make it difficult to blink, and cause dry eyes. Intermittent excessive tearing with dry eyes can also occur. Your eyes become slightly dry, which initiates reflex tearing, resulting in the production of large amounts of tears. However, after a short time, your eyes may become dry and irritated once again. Antibiotics. These medications help reduce inflammation of the eyelids. They come in the form of eye drops, ointment, or pills. Prescription eye drops. These contain corticosteroids and are used to control corneal inflammation. Artificial tears. These work like real tears to lubricate the eyes. People who cannot use artificial tears may use tiny eye inserts that are placed between the lower eyelid and the eyeball. These dissolve slowly and release a substance that works like eye drops. Your tear ducts must be partially or completely closed to reduce rapid tear loss. Tear ducts may be closed using silicone plugs, which can be later removed or just left in. Tear ducts may also be plugged using heat or thermal cautery, which is done under local anesthesia. You can cover your eyes with special contact lenses. Also called corneal shields or bandage lenses, these special contact lenses shield and protect the surface of the eyes and trap moisture to relieve dry eye symptoms. Unblock your oil glands. Using gentle massage to the lower eyelid, a new outpatient treatment (LipiFlo thermal pulsation) helps clear your blocked oil glands. Results are usually felt within a few days. Use OTC medicaine.OTC artificial tears can relieve mild cases of dry eyes. Ask your doctor which eye drops are best for you. You can choose from products that may or may not contain preservatives. Aside from drops, you can also choose eye ointments to lubricate your eyes for longer lasting relief. However, because they are thick, they may cloud your vision. These are best used before bedtime. Wash eyelids. Eyelid inflammation or blepharitis blocks the flow of natural oils to your eyes. Frequent washing of the eyelids may help relieve your symptoms. Use a warm, moist washcloth to gently rub the eyelids and loosen the debris. Using mild soap or baby shampoo, apply gently on the eyelids near the lashes with your clean fingertips. Rinse completely.